Moo0 is a very simple application which helps you permanently delete data from your hard drive so that it may not be recoverable in the future. 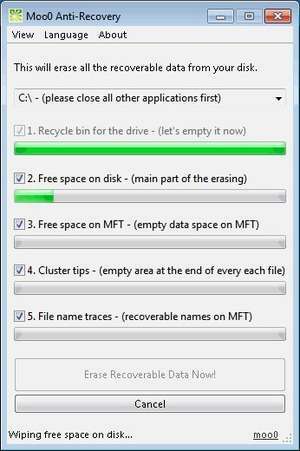 Contrary to popular belief, data is not immediately removed from your hard drive when you delete it. Indeed, it is still recoverable even after it has been removed from the recycling bin! With Moo0 Anti-Recovery, you can use the main interface to completely and irreversibly delete data which may be recoverable. For security reasons, you should also check out the Moo0 Anti-Recovery download at LO4D.com which includes virus and malware tests. Additional screenshots of this application download may be available, too.